Writing or talking of the specific traits or character concerning Church and religion one would, at the first glance think, that there is talk about the differences from other churches, in this case other Orthodox jurisdictions. This is not the case or the subject of this article, rather it is the intention to point out the positives which were developed through the history of the church, and in harmony with the teachings and dogma of the universal Orthodoxy. The organizational principle of the Orthodox Church is the one established at the First Ecumenical Council (325) at which time the church on the island of Cyprus and the church in Armenia were awarded autonomous status. This means that one ethnic group or geographical region receives the right to administer to its own needs, use its own language in worship and have its native clergy. Autonomy of the Serbian Orthodox Church was achieved in the beginning of the thirteenth century. The vernacular language and native riches of motives in church singing, chanting and customs all of this is present, yet the unity of faith is not only in tact, but it is enhanced with the riches of many and various historic, ethnic groups and nationalities. On the other side they compliment the Universal Church through their specific expression of life within the church — artistic and cultural creativity. There are some eighteen national, ethnic and historic groups of Orthodox Church jurisdictions. Most of them have their individual history of its development, struggle, triumphs and hard times. In most cases and time periods their history is identical with the history and life of its own people. So, the history of the Serbian Church is identical with the history of the Serbian people. In fact the spiritual values of the church became the values of the people: its development, creativity and culture. In such a set-up, the movement of the Spirit “as it wills”; is alive and functioning in full. In the case of the Serbian Orthodox Church and people this is manifested in the life, history and culture of the people itself. So, the values of the Gospel and the Church permeates through the life of every individual, and the people in forming the character of the individual and the nation as such. Creative forces are at work in the folk epics through the national bards who are inspired with the spirit and the values of the faith and the church. In fact this becomes the basis of the formation of the individual and the character of the nation. The most significant achievements are considered to be the works depicting the struggle for preservation of the faith and the people. They are Kosovo Cycle and Mountain Wreath of Njegos. The Serbian People received the teaching of the Christian faith and became converted by the missionaries from Byzantium. 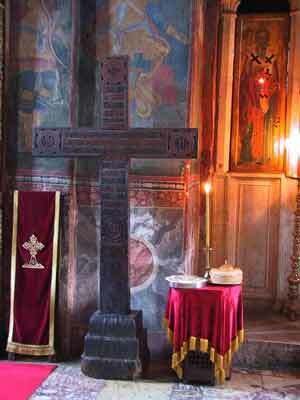 It was St. Sava who put down the foundation of the Serbian Orthodox Church. What St. Gregory was for the Armenians, or St. Patrick for the Irish people, or St. Denis for the French, or St. Antonius was for Russia, Saint Sava was for the Serbian Orthodox Church. Because of his imprint on the Serbian Orthodox Church the church’s name became synonymous with his SVETOSAVSKA CRKVA and the teaching of the church SVETOSAVLJE. It is not then out of place to hear some faithful refer to their church and religion as the “SERBIAN FAITH.” Because of this close tie to the founder of the independent Serbian Orthodox Church and the reverence for him, perhaps, many church and state heads among the Serbs followed the example of the Saint and became elevated to sainthood themselves. It is said that God reveals himself to man in the Bible and the life of the world. So it can be said concerning man in the Orthodox Church, that man reveals himself to God through the external symbols of faith and the customs of his Church and religion. One such custom for the Serbian people is the SLAVA. The is one of the distinct religious observances for the Serbian family and the nation. The family celebrates the SLAVA, as do many cities, civil and military institutions. This is in fact an observance of the day when the first ancestors became baptized in the Orthodox faith. They took the Saint of the day as their family patron. Male members of the family will carry the same patron Saint as they establish their own families. The most common patron Saints among the Serbs are: St. John the Baptist, St. Nicholas, St. George and many others. Among the Orthodox Christians, Serbs are the only ones who have this religious observance. One, even being a good and pious Christian, and not observing Slava as a Serb, would be looked on an “orphan”. Then there is the BADNJAK custom. Again, this is a typical Serbian custom which takes place during the observance of Christmas, and carries a significant symbolic spiritual meaning. This is equivalent to a Christmas tree. The decorative side of the BADNJAK is not considered at any point. There are some other smaller and less important in significant customs. Yet, all of them are expressing the presence of Church in the home and the nation. All that we have mentioned above has a direct imprint in the formation of the character of the believer. The late Bishop Nikolai in one place sketches the main components of character realized in the life of the nation as he states: “The character of the Serbian people can be seen in the love of Christ; in St. Sava; in the sweet soul of King Vladimir; in the endurance of Nemanja; in the eagerness of Milutin; in the humility of Stefan of Decani; in the humbleness of Urosh; in the sacrifice of Lazarus of Kosovo; in the gallantry of Strahinja; in the love of justice in Marko; in the Yugovich’s mother’s heart; in Militca’s truthfulness; in Yevrosima’s. The progress and success in edification of human soul in faith in God and morals grounded on that faith, will justify the existence and work of church itself among its people. This element would give substance and the meaning to all other branches of human endeavor. Values of this kind are tested in the great crises of a nation we have seen in this brief sketch on the Serbian Orthodox Church. It appears that the disaster of Kosovo Polje at the end of the fourteenth century became the testing point of the Gospel’s and Christian values in the history of the young Serbian Nation. So, Kosovo in religious, moral, and national sense became the great victory, which will inspire generations for centuries to come to the present day; to fight “for the Venerable Cross and Golden Freedom”. In the same sense and in a similar situation, during the Second World War, decendants of Kosovo would say now to the invader from the West: “better to be in the grave than to be a slave!” Even being exploited in the worst way by the international conspiracy and by many among its own people, this remains a moral axiom worthy to remember and to emulate. In both instances we see the main point: to preserve moral values and our own soul. This is the way the people and church show how to vanquish death. The Battle of Kosovo was fought under the slogan: “for the Holy Cross and Golden Freedom!… This kind of moral strength went down into the tomb of national suffering and thus became the pledge of national resurrection”. There was a main point namely: that moral values of the Gospel are put above life itself, because it will outlive life not only of our generation but many generations to come. After Kosovo many were forced one way or another to embrace the religion of the conquerors, be it from the East or the West, but the purity of the faith, language, customs and moral values was preserved in the remote mountainous regions and villages of the simple people. Today temperance; in Kosovka Girl’s mercy; in the endurance of captive people; in the blind bard’s vision; in the wisdom of the Serbian monks and priests; in the modesty of Serbian girls; in the inspiration of the poets among the people; in the talent of the craftsmen; in the grace of the embroiders and weavers; in the clearness of the sayers; in the moderation and gallantry of the Serbian peasants, and in the radiance of SLAVA of all baptized Serbs. Thus, the character of the Church and the Nation became one and the same. We learn from history that from the time of St. Sava until the disappearance of the Serbian medieval organized state, during one and a half centuries there was accomplished even more closer merger between the Serbian people and its church. It is said that the merger between the people and the church began with St. Sava. Now it became a whole where the church will receive its full force from its people, states the historian Stanojevic. This was the spirit of a struggle and loyalty to faith and church. This became measured more and more with contempt of physical life and readiness to die “for some distant generations”. The circumstances of time and the nature of the struggle, which was imposed upon the people for its survival and for its national and religious preservation, gave to the people faith and piety and the seal of heroism. Another historian Jovan Cvijic states: that after the KOSOVO struggle there was formed a strong Serbian national conscience which will last until this day. This became sort of a school in which generations shall be educated, and in which process Serbs became inspired with a desire to revenge the old defeats and the renewal of the state. This shows us that in this process the Orthodox faith and the Serbian nationality, which merger started with St. Sava, now became ONE WHOLE at the end of the fourteenth century. The Orthodox faith among the Serbs in this process received a more and more ethnic character that the name “SERBIAN FAITH” became synonymous with the original Orthodoxy, as it was stated above in this article. This gave to the Serbian Church its specific character and identification for the time to come. Because of this fact, the historian Ivo Pilar said with full justification: that Serbdom and its Church are indestructible as long as the Serbian Orthodox Church exists. Because of this phenomenon Seriban Orthodox Church will be the object of the attack of all of its enemies through the history of her existence to this very day. DIASPORA lives in freedom and from such a position would be called upon to help both the church and the people in the present time of their struggle, which in many instances is similar to that of the first Kosovo centuries ago. Having this in mind, the efforts of the Serbian People within the country, and those in diaspora should be directed to defend and preserve its tried and lasting spiritual and moral values in a fast changing world of ours. The loss of the specific character of Church and nation would be the loss of their existence in the future. 1. ‘SVETI SAVA’ Spomenica povodom osamstogodisnjice 1175-1975 u Beogradu, 1977. 3. THE LIFE OF ST. SAVA, Bishop Nicholai D. Velimirovich, Libertyville, 1951, Serbian Eastern Orthodox Diocese for the United States of America and Canada. 4. CHURCH AND STATE IN YUGOSLAVIA SINCE 1945, Stella Alexander, Cambridge University Press.